Panama Papers: The EU must act now! More than 47,000 Europeans asked EU leaders to take action to fight tax fraud, tax evasion and money laundering, and we delivered all those signatures to the members of the European Council. Following that the European Parliament set up a Panama Paper Inquiry Committee to investigate the maladministration in the application of EU laws on money laundering, tax avoidance and tax evasion. There’s more work to be done, but this is a great start! Jean-Claude Juncker, President of the European Commission and EU leaders. Tax dodgers, mafia and corrupt politicians have to be stopped. The law must apply to everyone, it is not acceptable that the rich and powerful exempt themselves from their obligations to society or from punishment for crimes. For far too long now, the EU has been negligent. Laws have not been enforced and banks have been allowed to cooperate with money launderers. 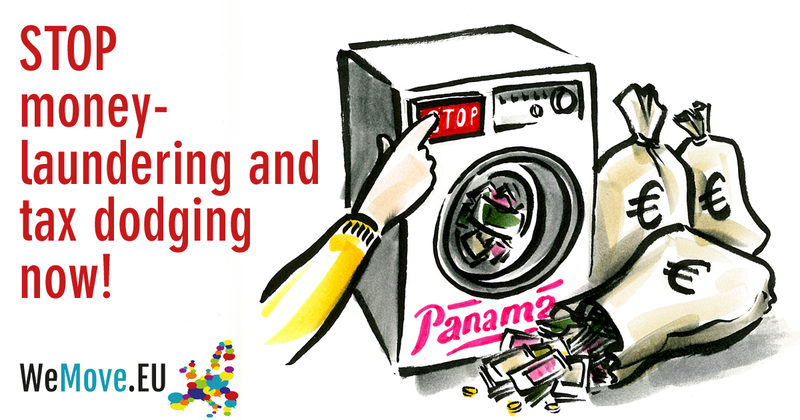 We demand effective EU-wide actions against money laundering and tax dodging to bring the culprits to justice and to stop this from happening in the future. We all knew it, but the scope of the scandal is just crazy. The Panama Papers show how the rich and powerful act as if they are above the law. From mobsters and dodgy businessmen to politicians and the biggest banks on the continent, thousands are implicated in tax dodging and laundering the fruits of crime and corruption. The scandal will only really unfold in the coming weeks as journalists reveal more and more of the Panama Papers. But this is not a time for despair. This exposure is a big opportunity for us. Politicians are now under unique pressure to do something about money laundering and tax dodging. If we come together, join in the tens of thousands, we can make sure that they really do something. The European Union has means beyond any country to have a widespread impact. But we have to act quickly. In this fast moving media environment every day counts. Money laundering and letterbox companies are only possible because our governments lack the political will to enforce rules against them. This has to stop! To avoid this large scale fraud from happening again, it is essential to create EU-wide prosecution authorities that transnationally investigates corruption, tax fraud and money laundering. The EU must also ensure banks that profit from and facilitate money laundering like Deutsche Bank or HSBC are punished - up to revoking their license to operate. This scandal rocks all countries in Europe. Donors of the UK conservatives , Deutsche Bank , football player Lionel Messi, and Spanish politician and EU commissioner Cañete are but a few who have been implicated. But our force also comes from all over Europe. This call to action goes out directly to over 200,000 members of the WeMove.EU community. Together with our partners we can stop money laundering practices. Sign to stop money laundering and bring the culprits to justice. When Elite turn in their own circles and betray on public interest - Democracy is just a street name with some historic significance. I would like to ask EU leaders, as a little piece of advice, since they are so good in economics: I would like to pay 0.005% from my income, as tax for the Dutch government. How do I proceed? Tax dodgers, mafia and corrupt politicians have to be stopped. The law must apply to everyone, it is not acceptable that the rich and powerful exempt themselves from their obligations to society or from punishment for crimes. For far too long now, the EU has been negligent. Laws have not been enforced and banks have been allowed to cooperate with money launderers. We demand effective EU-wide actions against money laundering and tax dodging to bring the culprits to justice and to stop this from happening in the future. Thank you for taking action on the Panama Papers scandal! PanamaPapers: We can stop it. #PanamaPapers show how the rich and powerful act as if they are above the law. But we can stop money laundering and tax dodging. This scandal is our opportunity! Sign now to make the EU act.